What is a student debt letter or indebtedness letter? While they’ve been given many names—Student Loan Notification Letter, Student Loan Disclosure, Loan Debt Disclosure, Education Loan Disclosure, Loan Summary—the term we’ve embraced is Student Debt Letter; easy to say and easy to comprehend. Regardless of the name it’s an important correspondence containing personalized student loan, financial aid, and college cost information sent by schools to their students. Student debt letter information not only helps schools retain the students they've worked so hard to enroll, it helps empower students to achieve better outcomes including strategic degree choices, maximizing credits, and reducing borrowing. Many states have mandated use of an annual student debt letter. New to debt letters? Download our Student Debt Letter Best Practices. Am I required to comply with student debt letter legislation? Why send a student debt letter if I'm not required to comply? What's in a student debt letter? It depends. 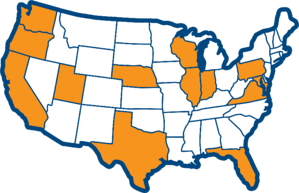 Currently there are twelve states with debt letter legislation: California, Florida, Illinois, Indiana Maryland, Nebraska, Oregon, Pennsylvania, Texas, Virginia, Washington, and Wisconsin. Each state has different parameters as to when they became or will become effective, which schools must comply, and how. To get up to speed, download Who Must Comply. The published legislation passed in your state. A quick guide to explain where the debt letter data comes from. More and more states are requiring student debt letters. This summary helps you understand debt letters, trends, and data calculation requirements. There are numerous things to consider when planning for and implementing a debt letter. For example, is it better to build your own debt letter or is it more cost effective to purchase one? Does the solution support your state's legislative requirements to enable compliance? It is configurable to meet your school's student success strategy? Does the solution let you send an email or a letter? Do reports tell you which students were sent an email or a letter, and when (for audit purposes)? Can you retrieve a copy of the correspondence? Is the communication responsive to an electronic device, like a mobile phone, tablet or laptop? For more tips, download Considerations for Planning and Implementing a Debt Letter. Figures indicate that today's college graduates leave with more than $30,000 in debt. And, Americans owe more than $1.4 trillion in student loans, surpassing credit card debt and auto loan debt. Yet, research shows that students who receive debt letters graduate early and with less debt. A Federal Reserve study shows that a combination of debt letters and counseling can change student behavior related to borrowing and academic decisions. For example, high debt Montana State University students were sent letters informing them about their debt and encouraging them to seek counseling. In the next semester, on average, they borrowed one-third less, were 2 percentage points more likely to switch to a STEM major (associated with higher paying jobs) and had slight increases in the amount of credits taken and grades earned. 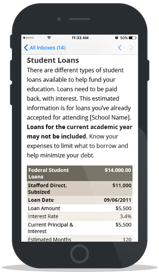 According to Money, in 2012 Indiana University was one of the first to use annual communications to remind students how much they've borrowed to pay for school, and to estimate future monthly payments. Four years later, students were borrowing 18% less in student loans. Debt letters have been proven to empower college students to take a strategic look at degree choice, maximize paid credits, reduce borrowing, and engage school support staff for tactical insight and guidance. Schools have different goals when communicating financial aid or indebtedness data to their students, so you'll want a solution that can accommodate your needs. A good debt letter solution will include an expansive list of financial aid categories to not only meet your current needs but be able to adjust to changes in your state's legislation or your school's debt letter strategy. Download a debt letter example.